For the first time since April 2015, there were more homes listed for sale in the Twin Cities metro than the same month the year prior. After years of strong buyer activity and weak seller activity, the tides seem to finally be shifting. Seller activity has been accelerating since the middle of this year. Meanwhile, the last four months all showed year-over-year decreases in pending sales. Unit sales volumes are still healthy, though there is some downward pressure brought on by tight inventory and rising prices and rates. The market is decelerating, but not yet contracting. Prices continue to rise, and homes are selling in less time. But absorption rates and the ratio of sold to list price are starting to ease. That’s good news for buyers, even though sellers still have strong negotiating power. 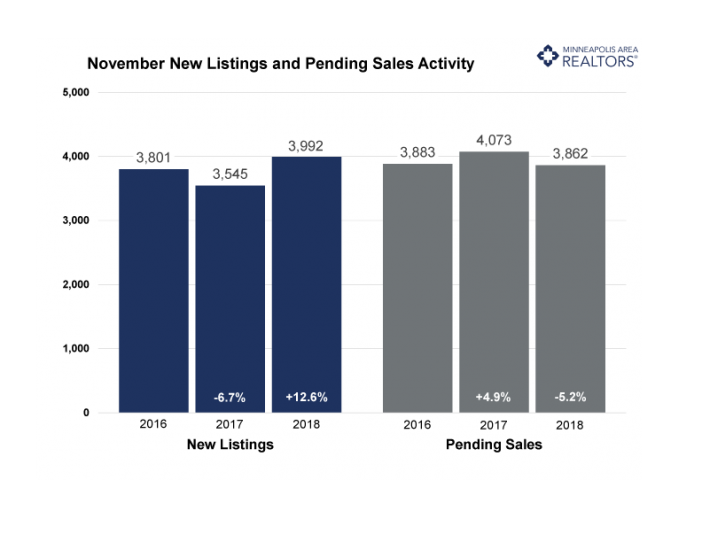 The number of active listings for sale has increased compared to the prior year. Buyers haven’t seen inventory gains in over 3.5 years. Months supply also ticked up to 2.1 months, suggesting the market is still tight but it is rebalancing and normalizing. After increasing in October and November, rates have settled back down around September levels. The lack of supply is especially noticeable at the entry-level prices, where multiple offers and homes selling for over list price are commonplace. The move-up and upper-bracket segments are less competitive and—for the most part—much better supplied. Inventory could double while sales remain stable and we’d still have less than 5 months of supply.